A betrothal was not quite the same as an engagement. It consisted of a public announcement soon followed by a contract that covered financial arrangements and other similar affairs. After the signing of the contract, a betrothal ceremony took place. Upon the signing of the betrothal, there was no backing out of the wedding; betrothals were legally binding. The betrothal ceremony required that the soon to be groom give the soon to be bride a betrothal ring. 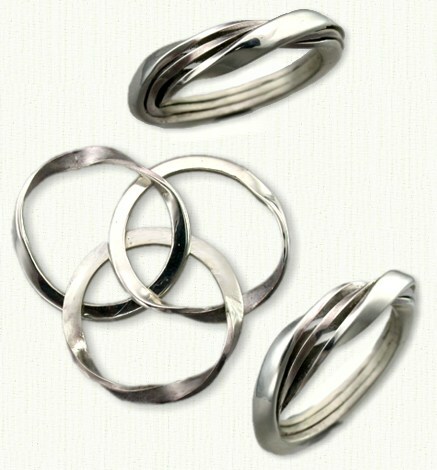 A betrothal ring usually consists of two or three hoops that can be worn all together. At the ceremony it was common for the bride to take one hoop and for the groom to take the other. During the wedding ceremony the two hoops would be put back together for the bride to put on her finger. 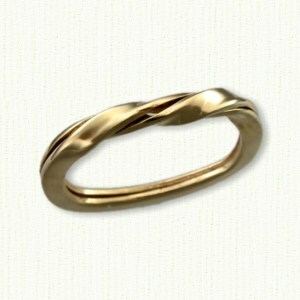 The Romans first introduced the betrothal ring as a plain iron hoop. Often times the rings would be adorned with inscriptions that embellished the inside of the bands. 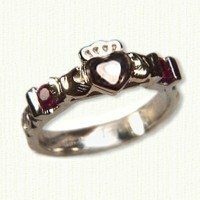 The betrothal ring was to be worn on the fourth finger of the left hand, as it was believed that a special vein in the finger ran directly to the heart. 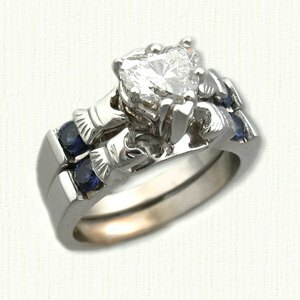 Betrothal rings start at $279.95 for two pieces and $375.95 for three pieces in 14Kt depending on final weight. Available in sizes 5-8. Please call for a quote. Created by jewelers of the Renaissance, the gimmel ring consists of two or more interlocking rings joined by a pivot to slide into one. Gimmel rings were created to symbolize the union of two lives. The Gimmel ring is a unique version of a claddaugh. 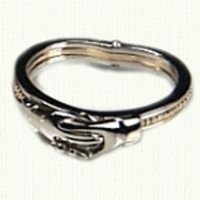 For centuries it was known as the betrothal ring symbolizing the promise of a future together, sealed with the giving and accepting of a ring. 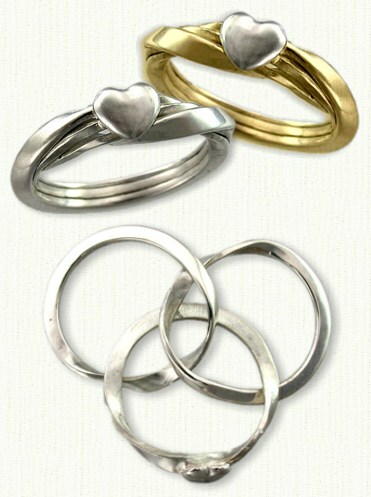 During the engagement, one part was worn by the bride, one by the groom, and the third by a witness. It was reunited as the brides wedding ring, on the day of their marriage. 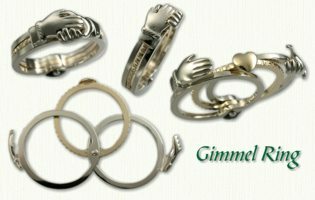 Click on the following link to visit our Gimmel Ring Collection. for pricing. Gimmel/betrothal rings with hands and heart start at $525 in 14Kt gold, with a Red Gold Heart $625 and multiple colored hands $575. Traditionally, claddaghs are expressions of love and friendship. Like most traditional symbols, the origin of the claddaugh has been obscured by the passage of time. It is almost certainly from the Irish fishing village of Claddaugh, near Galway. Some stories say that "back in the 16th Century a young love torn jeweler from Galway in Ireland named Richard Joyce was kidnapped by pirates. Thinking of the girl he left behind, he designed a ring to express how he felt. It consisted of a heart to express his love, a crown for his loyalty and hands for their friendship. On returning after 5 years he was delighted to learn she had not married, he then presented the ring to her. The Claddagh has been worn as a wedding ring ever since." Others say the design was brought back from the Crusades by a young man captured by the Saracens. Whatever its history, the claddaugh has become an enduring symbol of affection. The heart in the center of the design represents love, the hands that surround it represent friendship, and the crown at the top (if present) is symbolic of fidelity. 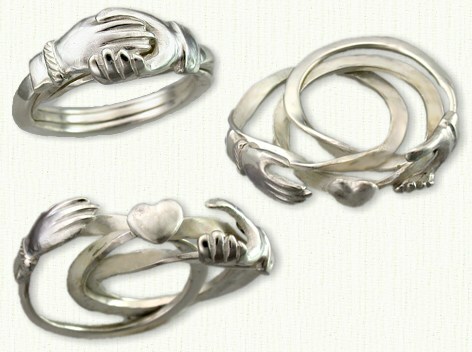 Claddaghs are worn on the left hand, facing inward, if your heart is spoken for. If you are unattached, wear the ring on your right hand, facing outward. 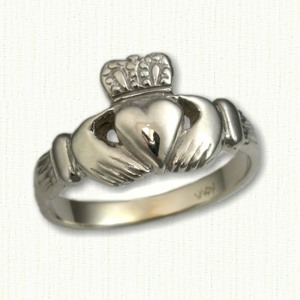 Click on the following link to visit our Custom Claddagh Jewelry Collection for pricing.